The less aged athletes on the team (myself and Andrew Young) moved, along with the juniors to Val di Fiemme for the World Junior and U23 world champs. I have attended 3 world level events in Val di Fiemme in the last 12 months as they seem to have picked up the slack for other venues that have had to drop major competitions for whatever reasons. Aswell as moving into slightly nicer accommodation than in Misurina the staff were also considerably more accommodating to the rather bizarre needs of a cross country ski team. One of the waiters had infact grown up in London and despite having spent his adult life in Italy had a very strong and distinctive accent. Carl, the Junior coach gave him the affectionate nickname of treacle but on checking his favourite online cockney slang dictionary, realised this was perhaps usually used toward women and often in a derogatory manner. Treacle stuck with him but I don’t think he minded too much. The first race of the week was a skate sprint. I don’t feel too much needs to be written about this, I’m not sure I was completely rested from the previous weeks training- something didn’t go right anyway! The following day we had a 15km classic time trial in heavy snow, ski preparation is a huge challenge on days like this due to the variability of the tracks throughout the course depending on the tree cover and how glazed or not the tracks become. I tested skis before the race on the first hill out of the stadium which proved to be a mistake, this hill had become very glazed with the number of skiers going through the spurs meaning I felt I needed more grip than I had on. Thomas and Åsmund adjusted the grip to my request and I went to warm up. Once into the race I found that I had a little too much grip on some of the hills meaning I was trying to kick ice off the middle of my skis at the tops. Not ideal although I felt better and managed a reasonable result with a 48th place. Friday was a day off racing for me, it snowed about a metre in the night so I was pretty glad I only had a short session as skiing was pretty heavy going. Saturday was a 30km skiathlon (15km classic, 15km Skate). The first couple of kilometres of these mass start races are usually pretty wild with broken poles and sometimes skis left right and centre as everyone tries to move from 7 lanes into 4 into 2 etc, this one actually seemed pretty civilised. Maybe the lashing rain encouraged people to ski in order to keep warm rather than fight with one another. The race went really well for me I managed to avoid pushing too far into the red in the classic meaning I had a bit left for the skating. Unfortunately I had quite a big fall in the skating when I caught the tip of my ski in the banking at the side of the track on one of the downhills, this knocked the wind out of me a little and probably slightly affected my final result but I imagine it was pretty amusing for any onlookers. I moved up into a final position of 32nd which was a good improvement on my ranking of 40th but I would like to think I could have managed a top 30 if I had stayed the right way up. Following a quick turnaround in Munich we were on a flight to Moscow where we stayed a night before flying onto Sochi. 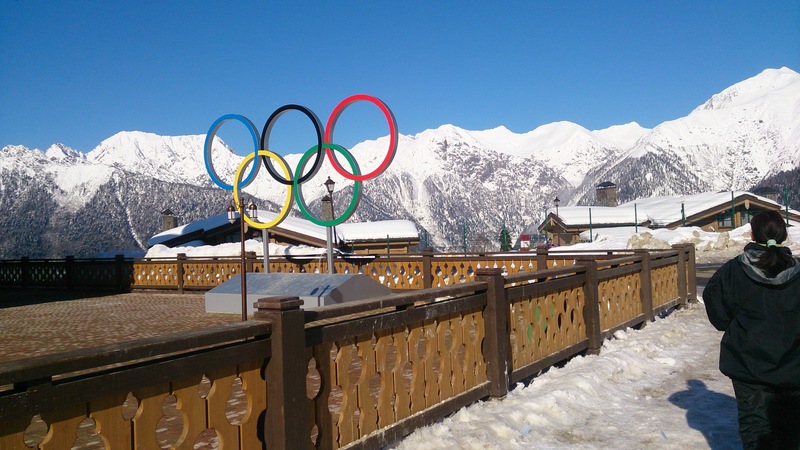 On arrival in Sochi we underwent some security checks before getting on a coach and heading up to our Athletes village at the Laura cross country and biathlon stadiums. We seem to have ended up with some of the nicest accommodation of the whole of team GB with a complete chalet between us and the biathlon team. My roommate for the next three weeks is Lee Jackson from the biathlon team, he seems to be putting up with me so far and I haven’t been referred to as ‘the weirdest boy I know’ as yet, although it was probably a pretty close run thing when he came in earlier to find me sitting in bed reading with my new ski boots on. The tracks are fantastic up here and so far we have only had sunshine. My first race is on Sunday so I’ll keep you updated. This is the view from our balcony, not too bad.